Responsible. Does the work or activity to achieve the task. There is at least one role with a participation type of responsible, although others can be delegated to assist in the work required. Accountable. Ultimately answerable for the correct and thorough completion of the deliverable or task, and the one who delegates the work to those responsible. An accountable must sign off (approve) work. There is only one accountable for each task or deliverable. Consulted. Provides opinions and advice on the work, such as a subject matter expert. Usually, this involves two-way communication. Informed. Kept up-to-date on progress or completion of the task or deliverable. Usually, this involves just one-way communication. 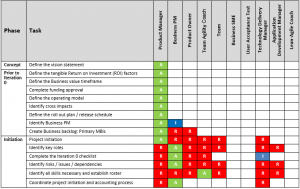 Here is an example of a RACI chart for roles in Lean-Agile. Note that organizations usually tweak this chart to fit their own context.